Coffee only has nine calories per cup, but before you sip that hot, steamy brew, it's important to know the relationship between caffeine and weight gain. Drinking coffee or other caffeinated beverages can actually sabotage your efforts to lose weight. Do you wake each morning with new determination to eat healthy and within your calorie limit, only to find yourself snacking or eating more at lunch than you had first planned? Limiting your intake of caffeine can help you control your food cravings and stay within your dieting goals. According to a study published by the National Institutes of Health, caffeine affects cravings for food because it raises the stress hormone cortisol. Cortisol raises heart rate and blood pressure and tells your body to increase its energy stores. This results in the body craving sweets. So if you're wondering why you snacked on cookies in the afternoon, it could have something to do with that coffee you drank with breakfast. Low blood sugar, also known as hypoglycemia, occurs when blood glucose levels drop. When this happens, your body doesn't have enough energy to perform regular activities because glucose provides important fuel for your body. The main dietary sources for glucose are carbohydrates like rice, potatoes, bread, fruit, and sweets. According to Life Extension Magazine, drinking caffeine can trigger hypoglycemia. The body's reaction is an increased appetite and cravings for higher calorie foods. The more caffeine consumed, the more your body urges you to eat. Caffeine-induced stress can actually interfere with how you feel about yourself and trigger emotional eating or a need for comfort food. This correlation between caffeine and weight gain is another good reason to consider weaning yourself from caffeine to reduce stress hormones that result in emotional eating. Since caffeine can raise cortisol levels, it's important to take a closer look at what this means. Higher levels of cortisol can leave you feeling anxious, fearful and even lashing out in frustration and anger. This diminished feeling of well-being can even lead to feelings of depression and affect your ability to communicate and learn. Elevated cortisol levels can also result in increased belly fat. Decreasing caffeine intake combined with regular exercise can help you reach that goal of having a flatter stomach and better overall health. According to the American Diabetes Association, caffeine may also contribute to insulin resistance. When this happens, glucose and insulin builds up in the blood. It's common knowledge that drinking coffee can also cause insomnia and sleep deprivation. Both of these conditions are related to insulin resistance, and insulin is a metabolism hormone. It affects every cell in the body. 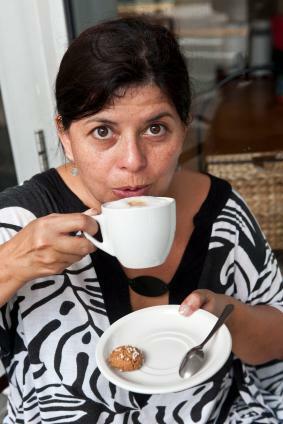 Breaking the caffeine habit can help lower the risk of insulin resistance and, as a result, help manage your weight. Don't let caffeine sabotage your efforts to lose weight. Limit your caffeine intake, and you'll have better control over your appetite. Instead of reaching for a cup of coffee, learn to drink herbal teas, water, or smoothies made with fresh fruit.